As we have developed and grown, so has our need for a new and improved website! Check us out at www.studioblueonline.com and take a look around. Our new website offers sophistication, fast loading capabilities, mobile adaptation, and the ease of finding exactly what you need in a clearly organized toolbar. Studio Blue has a unique family history behind it, and we are proud of the customer service and reputation we have in helping so many of today’s businesses and individuals. Still owned and operated by family, Studio Blue holds true to our standards to keep customer service as the basis of our efforts. And in keeping with that tradition, we understood we needed to have a website dedicated to delivering faster service with excellent results. With that in mind, www.studioblueonline.com was reborn. For many of our customers, you like to see what we have done in the past to get ideas for what we can do for you. Our products page is dedicated to providing you with specific details, dimensions, and examples of some of the items we have created for existing customers. The possibilities are endless! 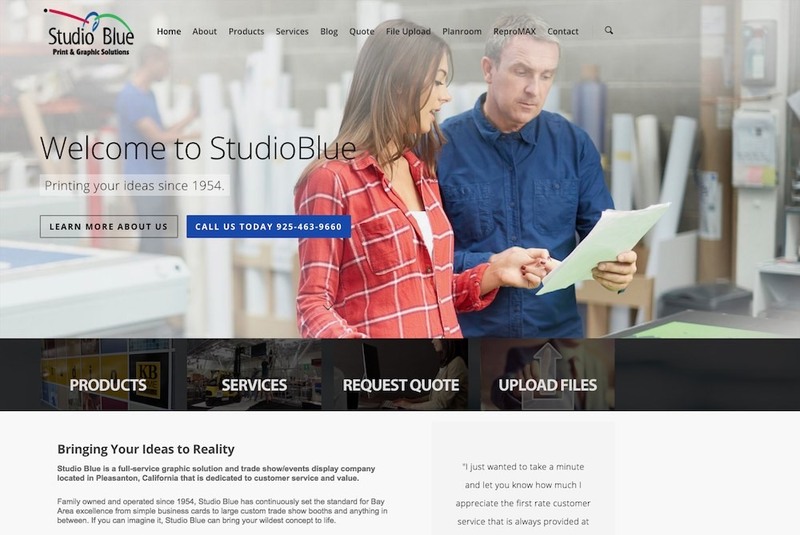 Our services page allows you to read about the ways Studio Blue can make your life and that of your company easier with design, installation and removal, and consultation. Take the work off your shoulders and allow us to help you make your exhibit or event hassle and stress free. Want a quote? We offer the convenience of asking for online quotes with an opportunity for you to discuss your project and send us files and uploads. Your security is a top priority, and Studio Blue is proud of our innovative efforts to manage your documents with our ReproMax DFS software. Have a need you want addressed by a live person? Feel free to contact us by phone or email, and we will respond within one business day. Our easy to use website will also direct you to our location, so finding us is the first step to creating the project of your dreams. If you can dream it, we can create it and more! Visit our new website at www.studioblueonline.com on your laptop, tablet, or mobile device, or stop by and see us today!